before filling my pockets with lavender-scented poop bags and kibble. Then I spend a solid 10 minutes trying to clip a leash on my very excited dog before michelin-manning it out the back door. Every time that blast of cold hits my face, I think: “I’m a good dog owner, I’m a good owner, I’m a good dog owner” while gritting my teeth and dreaming about the fence we’re going to get as soon as the ground thaws. By about the tenth minute, we’ve reached a local trail and Odie is prancing about like a king. I can’t feel my nose. 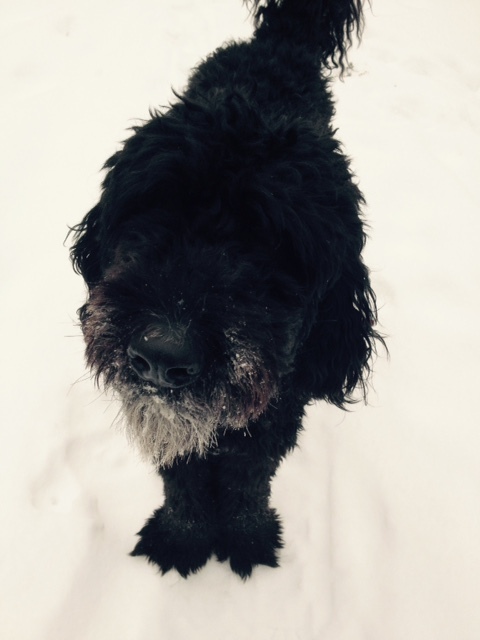 There are no dignified photos of me in my dog walk getup, so here’s one of Odie in the snow, pre haircut. The walk home – about half an hour later – is usually a bit more eventful. Cars pulling out of driveways, kids walking to school, and retirees taking out their garbage in their pyjamas. Odie, whose universe used to be limited to a backyard, greets them all by jumping on them. But last week he suddenly started barking. I was puzzled until I saw the stout elderly lady who had slipped and fallen. She’d been on the ground in her nightgown for nearly half an hour in -35 degree weather. Her nose was bleeding, but she didn’t want a doctor. She asked for help getting up and into the warmth of her home. I tied Odie to a post, put one of my billion layers over her legs, ran to get JF, and we helped her inside. After about ten minutes of hand-wringing over the possibility that she was concussed, I called the paramedics after all. Before leaving for work, I made sure they found her house. On our after-work walk, Odie and I dropped in for a visit. Jean was fine, but her nose hurt like the dickens. Morals of the story? Dog walking is a great way to meet people. Also, visit your older neighbours regularly. Also, spring will be awesome. 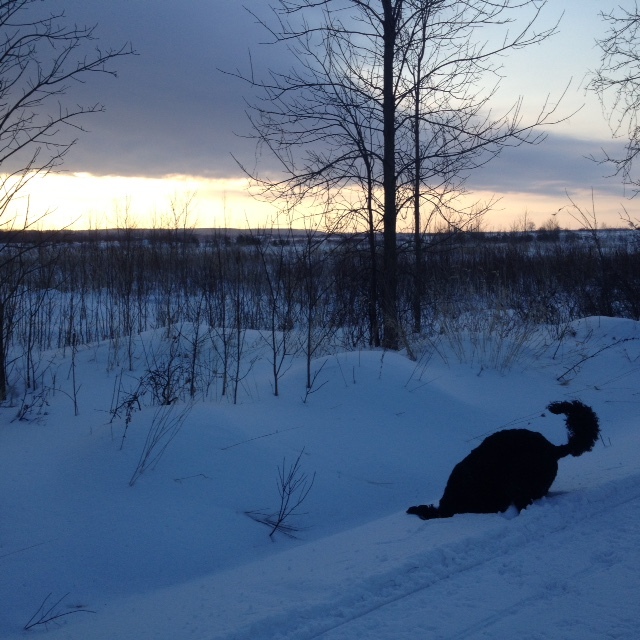 This entry was posted in Community Events, Family and Friends, Love, Small Town Living and tagged cold, Community, dog, Elmvale, michelin man, morning, neighbours, walk by Mikaela Lefaive. Bookmark the permalink. Sounds like an episode of “The Littlest Hobo”!